There's gotta be room for all this. Once you’ve gone through all the work of creating a world, setting multiple stories there seems natural. You’re a busy writer after all; you don’t have time to create a new world from scratch every time. If these stories are not directly related, then congratulations, you’re creating an anthology. Readers can get attached to your setting without having to read your stories in a specific order, and you can have cool crossover stories where your best characters team up. But it can go wrong. Superhero comics notoriously mash characters into the same setting, even when they don’t fit. 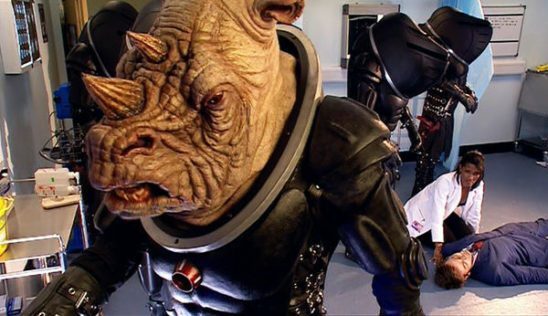 TV shows like Star Trek and Doctor Who try to tell multiple stories in the same world, and they end up contradicting themselves as often as not. Fortunately, you can head these problems off if you do your homework properly. At least 100 more heroes are just off screen. The first step to telling anthology stories is building a large world. If your world isn’t big enough, all the stories will muddle together. Audiences will wonder why the characters who live so close together never meet or why the events of one story don’t have more of an impact on the others. If you address those questions by making the stories more interconnected, then you’ve lost a major advantage of an anthology: audiences don’t have to read them in a specific order. For a bad example, look no further than Marvel’s comic-book universe. While that setting technically stretches over the whole Earth,* it focuses heavily on New York City. 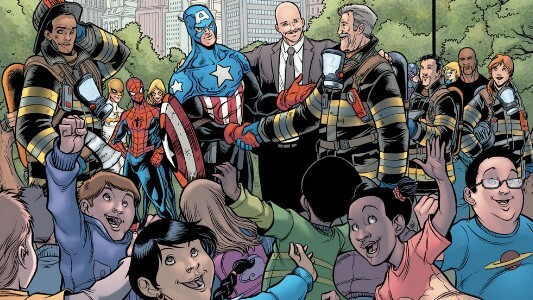 It’s not clear exactly how many superheroes make their home in the Big Apple, but it’s a lot. This not only raises serious questions about why any villain ever sets foot there but also damages credibility in solo adventures. Anytime Daredevil, Jessica Jones, Luke Cage, or any of the others respond to a problem, it’s hard to believe they aren’t crowded out by a dozen or so super-competitors. You don’t need to fully flesh out every element of the world in advance. That would be incredibly difficult and rob you of flexibility down the road. Instead, jot down a few interesting ideas for different places that you can come back to later. And no matter how much you like one location, don’t go back there until you’ve used a few of the others first. For a good example, see Discworld. * While Ankh-Morpork is clearly the center of the disc, Pratchett created dozens of other places where he could tell interesting stories. You can pick up the first book of Tiffany Aching’s adventures on the Chalk and not need to know anything about Commander Vimes or Granny Weatherwax, because they live in different areas of the Disc. Wait, it takes how long to get across the Federation? So you have a decently sized world where the protagonists of your various stories don’t all have to live next door to each other, but there’s another difficulty. Readers start asking why your main characters don’t ever get on a plane, train, or automobile to help one another. After all, when Plot City is threatened, it’ll be on the news, and surely the heroes of McGuffin-Ville will come help! Since you want to keep your stories distinct, this is a problem. Star Trek is particularly bad in this area. In that universe, both communication and travel move faster than the speed of light. 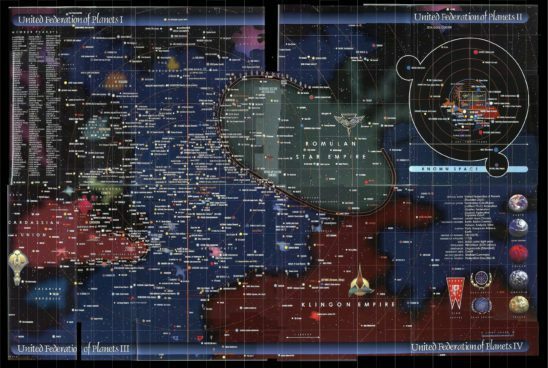 Even the most isolated parts of the Federation are well acquainted with the news of everything that’s happening elsewhere. And yet, when the Deep Space Nine (DS9) characters are fighting the most important battles of the Dominion War, Captain Picard and the Enterprise-E are nowhere to be seen. Where else would Starfleet’s most powerful ship be during a desperate war? In Star Trek: First Contact, when the Borg attacked Earth, the DS9’s Defiant showed up at the fight, but Worf was the only main cast member on board. Did Sisko just decide to stay home? The Marvel Cinematic Universe is even worse. Where is Captain America during Iron Man III, when Tony Stark is fighting the supervillain equivalent of Osama bin Laden? Where is Tony when Captain America is dealing with a Hydra-controlled S.H.I.E.L.D.? These characters don’t live next door, but they all have cellphones and access to planes, so why aren’t they showing up to help each other? To avoid this problem, slow down the speed of both communication and travel. By the time a character from one of your stories hears about the problems another is having, they’ll already be over. Even though it’s not an anthology story, A Song of Ice and Fire is an excellent example. Characters in those books often have a global view of events, but usually can’t go running to their friends whenever something is wrong since it takes a long time to ride across Westeros. This can work for scifi as easily as fantasy. Just make travel between the planets in your space empire take years. Then you won’t have to worry about the characters from Narrativia IV intruding on Foreshadow II’s apocalypse story. I’m surprised the space/time police didn’t show up more often. If every story in your anthology is dealing with a problem that threatens the whole setting, it will get harder and harder to justify keeping them separate. Even if you limit communication and travel, you’ll have to explain why your scattered characters don’t band together against the evil plots that threaten them all. For an example that isn’t from comic books, see Doctor Who. The Doctor is constantly running into one universe-ending disaster or another, and we know other people in the Whoverse have the ability to travel through time. Why do they so rarely show up to help? Buffy The Vampire Slayer has the same problem. World-ending events happen every week in Sunnydale, so the town should be overrun with anyone who wants the world to still be there. Keep your problems more localized so you won’t have to explain why they don’t draw attention. That doesn’t mean the problems are low stakes. The invasion of a small town by monsters is super-high stakes for the people who live there, but it’s not likely to show up on everyone else’s radar. Discworld has this process mastered. It’s very rare that a plot hinges on the world being destroyed. Instead, you have Commander Vimes trying to keep interspecies tension from turning violent in Ankh-Morpork while Rincewind runs away from angry kangaroos on the Lost Continent. Then, if you do want a crossover between your stories, all you need to do is up the problem’s scale. Archchancellor Ridcully and Granny Weatherwax don’t normally interact, but they’ll team up if the kingdom of Lancre is threatened by marauding elves. Glad to see that after hundreds of years they still use swords and armor. Even if you take precautions to make sure your characters won’t stumble willy-nilly into each other’s stories, your world’s credibility can be damaged from too many important events happening at once. Readers will raise their eyebrows in disbelief if every interesting part of your setting is constantly erupting in the chaotic events that accompany any good plot. Once you run out of space, you can separate your stories with time instead. Letting a few decades pass between stories will make sure the world has time to settle down a bit before everything erupts again. Even more importantly, it’ll give time for the previous generation of protagonists to shuffle off this mortal coil so they won’t steal the next generation’s thunder. To pull this off successfully, you’ll want to spend some brain power figuring out how your setting will evolve over time. Societies are rarely static, and your world will be more believable if the passage of time means more than a different set of faces using all the same stuff. Authors forget this on a regular basis. Many of the Narnia books take place decades, or even centuries, apart, and yet the setting is always a fantasy version of medieval Europe. That might have been acceptable in 1950, but readers today will expect a more logical world. It takes all sorts to make the disc go round. Let’s say you’ve taken all the steps necessary to make sure your anthology stories don’t get muddled together. You have one more problem. If every part of your setting is the same, your stories will get boring fast. As much as I love Star Trek, the original series had a real problem with every planet the Enterprise visited being the same. Part of this was due to the budget. The show only had so many sets, so the alien planets were bound to look similar. But more importantly, the writers recycled several plots until they became predicable. The first time Kirk ran into an all-powerful computer and talked it to death, it was awesome. By the third time, the magic had worn off. However, you don’t want your settings to be too disparate either. If the different parts of your world have nothing in common, you might as well use different worlds. For the perfect balance, establish a few broad themes, and then create diversity within them. This will keep the audience from getting bored, but also maintain the cohesion that anthology stories need. 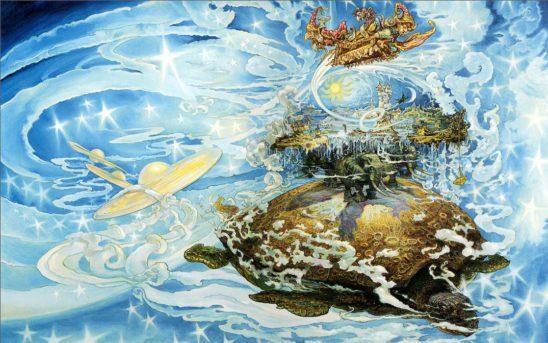 By now you won’t be surprised that Discworld gives us a positive example to follow. The disc plays host to everything from London-inspired Ankh-Morpork, to rural villages on the Chalk, to the Arabian-themed Klatch. These places all have distinct atmospheres, and long-time readers know where they are without ever being told the location’s name. Ankh-Morpork even contains huge amounts of diversity within itself, from Klatchian immigrants to dwarven print shops. But while no two places on the Disc are the same, they all share Pratchett’s distinct style of humor and proclivity for subverting expectations. No matter where you go, anyone in charge is suspect, because those who seek power are rarely worthy to wield it. From the Ramtop Mountains to the Counterweight Continent, you know that anyone who looks like a huge badass is probably just full of themselves, and it’s the quiet one in the corner who’s really dangerous. If you can capture this duality of diverse settings and consistent themes, your anthology story will be in good shape. Anthology stories are a strange beast in the world of writing. Some writers treat them like a really extended series, but they have very different requirements. If you try to tell a story in a setting that was originally meant for a novel trilogy, you’ll be in trouble. The worldbuilding requirements are stricter, but the results of success are well worth it because you can tell such a breadth of stories. Just be sure you’re willing to put in the work. And many alternate Earths besides. Planets are big, it turns out. Unless this is a team-up comic. Other than adding seat belts, of course. No lie, whenever I use the past tense in regards to Terry Pratchett, I get a little sad. 1-In regards to Marvel universe, i’d like to give them the benefit of doubt that even though they don’t say it explicitly many of these movies/stories in the MCU happen concurrently, or at least parts of them .. meaning that while Ironman was was dealing with his Bin Laden inspired antagonist in Ironman 3 Captain America was dealing with the problems in SHIELD and Hydra’s infiltration of it in Winter Soldier, other heroes could be off somewhere else doing their own business (like Hulk choosing to isolate himself and live a monk like life if hopes of gaining better control of his anger or Hawkeye taking some time off to spend it with his family in their relatively isolated house), it’s only when the stars align or the threat is so big (major alien invasion like the first Avengers movie) that multiple heroes will get together to deal with it, Daredevil and Jessica Jones never faced world ending threats in their stories so they are more focused on local level threats, local mob bosses and the local psychic psycho, i can’t imagine Captain America will leave his Hydra problems to go deal with Kingpin (though that said Kingpin did fight some hi-level heroes like Spider-Man on occasion) .. and for all its problems i think the Batman vs Superman movie portrayed that well, we wonder what was Batman doing during the destruction Superman fighting Zod caused, and they show us that .. he was on the streets watching it like everyone else, cause that kind of problem was out of his scope (an alien invasion) .. he didn’t get enough time to prepare or get involved in the fight in any meaningful way .. and that experience is also part of what drove him to do what he did in the BvS movie .. sure there are inconsistencies in this idea but it makes the whole thing more plausible. 2.About Narnia, if you look at a time-map of human history you will see the greatest and biggest advancements in tech and science happened in the last 100 to 200 years, before that things were SUPER slow (think of it as an exponential curve) .. in ancient times it would take centuries or even millennia for a major world changing advancement to happen, if you go to the last days of Ancient Egypt or Ancient Greece at first glance you won’t notice that much of a huge difference between them and Medieval times despite the hundreds of years difference or more .. only if you sit down and research each period you will start to notice the advancements that happened in several fields over those hundreds of years, but still many aspects of society will still be the same or advanced very slowly, so it is plausible that the world of Narnia didn’t go through any major technological breakthroughs or advancements during the span of the stories, specially that there could major forces working against it (magical ones as well). I agree on both points, but your first point hits the main complaint I have with this article. Oren’s second piece of advice contradicts his first piece of advice. We want a world big enough that characters in one part don’t need to always bump into characters in another part, if at all, and yet Oren wants a full, explicit accounting of Sisko’s whole day while Worf borrows the Defiant to fight the Borg (plus, apparently, the Defiant’s travel log, with stardates and warp factors neatly tabulated, so we know down to the second where it was at all times, before joining the battle). I intentionally exaggerate Oren’s demands, to emphasize how little these things matter to the plot, and to emphasize how much an explicit, obsessive focus on them actually detracts from willing suspension of disbelief. Just take it as given that Sisko’s busy running an entire space station, and it’s not his job to go trotting off to respond to every emergency at Earth, that there are established chains of command that must be delegated to, that Sisko and the Defiant are separable entities, and also that Avery Brooks wasn’t in the movie for financial and scheduling reasons, plus the movie needed to account for casual audience members rather than only dedicated Trekkies. It would have been weird to start chatting about an irrelevant character, who has a enough good reasons not to be there, in the middle of a pressing crisis situation, and there was no point later on when Sisko mattered to the movie. We know the Enterprise was involved in the Dominion War on other fronts, from the novels and from Insurrection. We (excluding Oren) could easily have imagined this without the novels. We also know we were never going to see this on screen because TNG was long over by this point, and its movies were not compelled to focus on a DS9 plot (yet Insurrection and Nemesis both nod to it anyway, regardless of all the other things those movies can be criticised for). And given the large number of ships in Starfleet (estimated to be somewhere in the thousands, possibly tens of thousands), and the many that DS9’s scripts did have better reasons to explicitly name, it would seem unrealistically improbable if they had kept us updated all the time about just the Enterprise. The DS9 crew had little connection to it anyway; only Worf and O’Brien would have any special feelings about the Enterprise crew over any other starship crew, and little reason to explicitly discuss it with each other on screen. Oren, I think your big error here is mis-applying your own rules. I’m happy to agree that, in principle, writers should take world scale into consideration, and that it can make some difference to audiences’ ability to believe the world. However, neither audiences nor stories exist in a vacuum, and both have to take real-world production limits into account. Part of willing suspension of disbelief is first knowing what it is you’re supposed to be disbelieving. And for complex anthologies (especially ones that require multiple writers, actors, production designers, available technology, budgets, legal contracts, etc. ), these production limits can be major. It’s much easier for a single author of their own series of image-free, actor-free written pieces to cram in whatever they feel like, because they’re the only one who needs to be consulted. But screen-writing (and to some extent, comic-writing) is much more restrictive, and I think most audiences (unlike Oren) get that. A similar thing came up in another of his recent articles, demanding to know why the producers of Babylon 5 didn’t break real-world physics (or break their finite budget) to film that show’s human crews on zero-gravity sets. We all love it when film magic lets us see something new and exciting that was previously considered impossible to show, and I’m all for supporting the continued development of special effects. But we also all (again, with the apparent exception of Oren) accept that there are still real-world limits to even the best special effects. Similarly, there are real-world limits to all aspects of production. Even when something can be mentioned or shown, when there’s nothing preventing it from being included, that doesn’t mean it HAS to be mentioned/shown. Oren’s first recommendation was right. I actually live in the same world as an actual Hawaiian newspaper reporter named Gary T. Kubota, and yet this is probably the only time I will ever mention him. The audience (who watch my life as a sitcom, through the secret cameras everywhere) don’t say, “Hey! He never mentions Gary T. Kubota! Now I can’t accept anymore that they believably exist on the same planet together!” Some links need not be explicitly drawn. Big world building doesn’t mean cramming every possible person, object and action onto the page or onto the screen at all times. It means first viewing the world through one finite window in one place, then viewing it through another, similarly limited window in another place, and also giving audiences just enough evidence to believe that these windows exist in the same continuum. And then there has to be some trust that the audience will figure things out on their own, without needing to be spoon-fed every step of the way. The Thieves’ World did that very well … but then, it was built for characters from several different authors to mingle together. They set up rules which made sure nobody accidentially killed someone else’s characters. I rather enjoyed the books, each of which had several stories from different authors in it. Oh my gosh so glad to hear someone else mention Thieves world. I loved that series, and never read another quite like it. The multiple authors made it amazing. I must have fallen in love with nearly every aspect of it growing up! Take-away from the article: Discworld is amazing and written by a genius. You can’t argue with that truth. I think a better Star Trek example for Limit Travel and Communication would be Star Trek: The Motion(less) Picture, where a mysterious force is heading towards Earth, home of Starfleet Headquarters, and exactly ONE ship is able to respond: the not-fully-functional Enterprise. And again in Star Trek V: The One That Everybody Ignores. A Crisis arises on a planet far away from Earth, and the Enterprise, currently at Earth and about 40% functional, is the only ship with an “experienced” Captain that can respond. I’m not sure if I’d hold Discworld up as a great fantasy setting. The setting was just a vehicle for satire, and changed according to the needs of each story, rather than because of any meaningful world development. To begin with, it was a spoof of pulp settings like Lankhmar and authors like Howard and Lovecraft, and by the end, it was basically Victorian London with the names changed. There was a very definite shift in the 90s away from pure fantasy stories towards what was essentially British social satire. I think by around 2000 Terry wasn’t even interested in writing Discworld novels anymore and would have preferred to write stuff like Nation, set in a pseudo-19th century, but he (or his publishers) couldn’t escape the fact that his novels would sell 10x as much if he set them in Discworld. That’s why the Discworld books thereafter generally take a turn away from the fantastic and more towards lampooning British society and history. Sam Vimes was the most adaptable character to this new style, which is why he still sometimes takes centre stage after that point, while other characters and settings (Lancre, Death, Susan Sto Helit, Rincewind) tend to fizzle out after this point, being reduced to a few cameos for fan service. I don’t know about that … Susan’s last outing was well inside the 2000 bracket (Thief of Time). The witches still had their stories during the last years, too. Rincewind got himself the job of assistant librarian and guardian of the roundworld (see the ‘science of Discworld’ series). It’s true that a lot of new characters came up (like Moist von Lipwig) and Ankh-Morpork took a centre stage, but the development as a such (technology coming up) was foreshadowed before. It was just sped up, compared to the ‘real’ world. 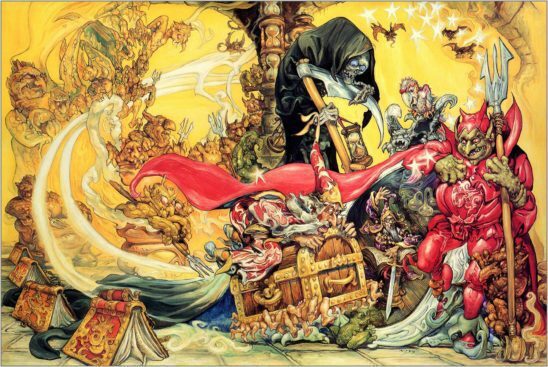 I always liked the fact that the Discworld evolved and didn’t stay the way it was at the beginning.